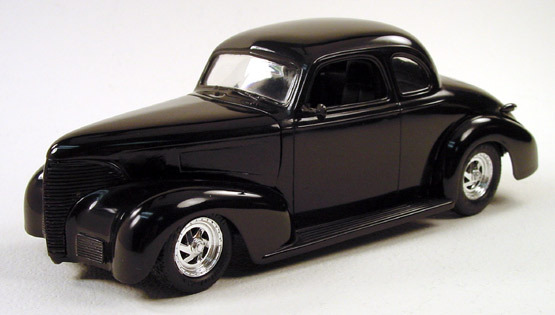 The inspiration for this 1939 Chevy coupe street rod came after I attended my first Street Rod Nationals back in '88. The high-tech, "Boyd" look was just starting to take off. 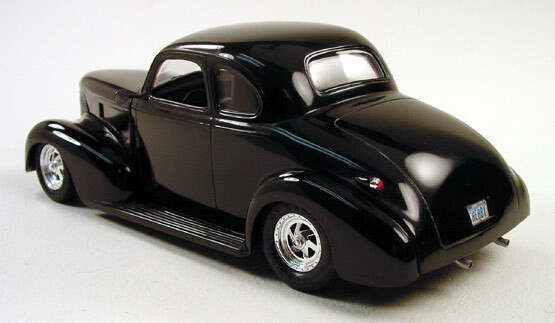 I used the classic 1/24th scale Monogram 1939 Chevy coupe street rod kit as my starting point. I smoothed the body, added side vents to the hood, a recessed license plate and hidden headlights. Wheels and tires for the Chevy street rod came from my parts box. The paint is Testors gloss black shot straight from the spray can. This model has survived a couple of house moves and is still in good shape today.